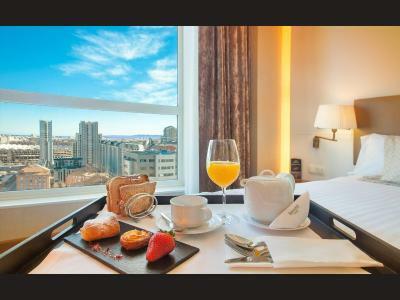 Lock in a great price for Sercotel Sorolla Palace – rated 8.6 by recent guests! Beautiful room with an amazing view. The staff were nice but not as friendly as in other establishments of this style hotel. 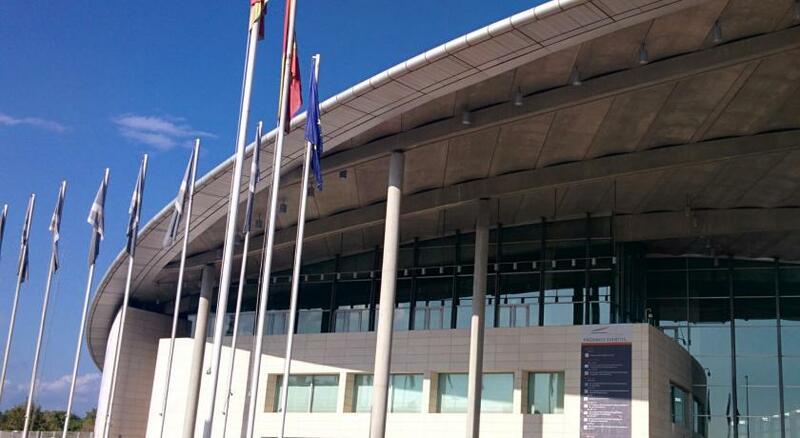 the closeness to conference venue, the value for money. The facilities were adequate, however, we had to ask for a kettle and coffee.tea - the room was initially without it. But as soon as we asked - we received it! Internet was fine. View was gorgeous, room was clean, and staff was super friendly! Very kind and professional front desk service. Very nice sauna. 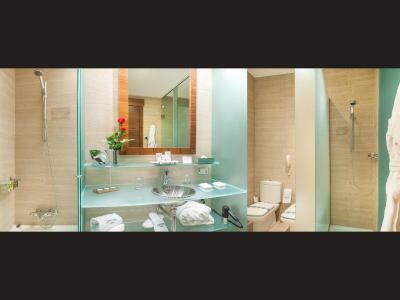 Spacious rooms and music in the bathroom. Big bonus: always at least several taxi cars available in front of the hotel (very cheap way to reach the old town in minutes). Everything. Nice swimming pool area ( though a bit small). Very friendly staff. Nice buffet. The hotel is well appointed ted, clean and welcoming. Wehave stayed here many times over the years and it improves each time. We loved the new bar area near the pool- a stylish addition. It’s just beside Palacio de Congresos de Valencia and the bus stop for the hop on-hop off city tour is just across the street so it was very convenient for us. There’s also a grocery store down the street. The location is quiet and secure. Sercotel Sorolla Palace This rating is a reflection of how the property compares to the industry standard when it comes to price, facilities and services available. It's based on a self-evaluation by the property. Use this rating to help choose your stay! 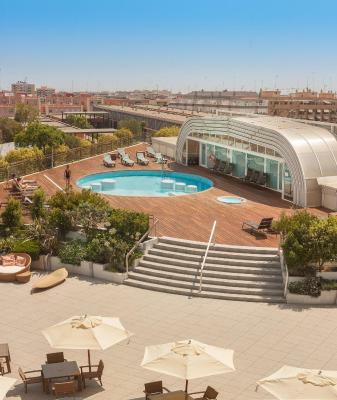 One of our top picks in Valencia.Featuring a pretty terrace with an outdoor swimming pool, the stylish Sorolla Palace is located 150 feet from Valencia’s Congress Center. 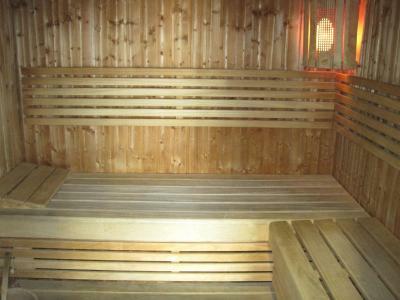 It offers free Wi-Fi, hot tub and a gym. The Sercotel’s rooms feature bright, attractive décor. All rooms are air conditioned and have a flat-screen satellite TV. The upper floors of the Sorolla Palace offer impressive city views; and the outdoor pool has a retractable roof which covers it during the winter, spring and autumn months. 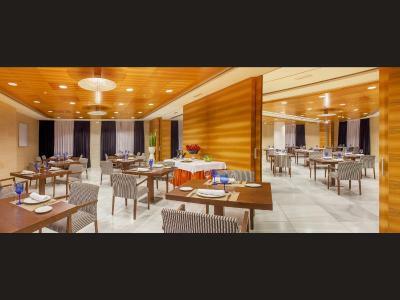 The El Dossel restaurant offers Mediterranean dishes and international cuisine. There is both a main dining room and 4 private dining rooms. L’Estany café serves tapas and a range of cocktails. A buffet breakfast is served daily. 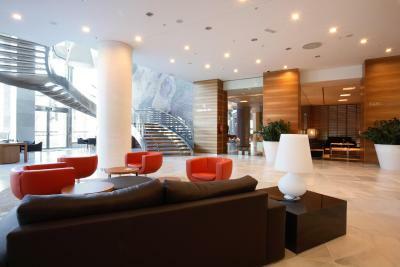 Sercotel Sorolla Palace is a 5-minute walk from Beniferri Metro Station, which is 9 stops from the City of the Arts and Sciences. Beniferri Park is just 350 feet from the hotel. When would you like to stay at Sercotel Sorolla Palace? This bright, air-conditioned room includes free Wi-Fi and a flat-screen satellite TV. This spacious, air-conditioned junior suite has a separate lounge area. 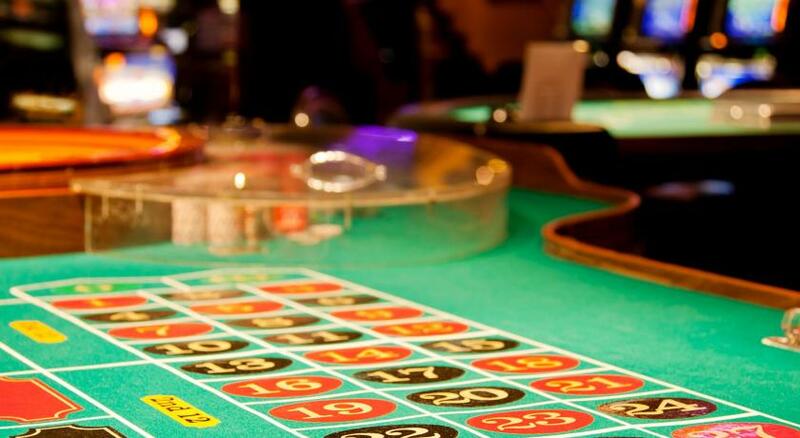 It includes free Wi-Fi and flat-screen satellite TV. There are also large windows offering pleasant views. 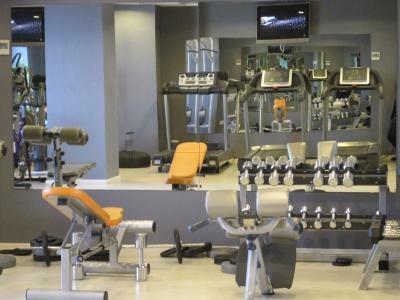 This more spacious, air-conditioned room features free Wi-Fi and flat-screen satellite TV. This more spacious, air-conditioned room has 1 double bed and 1 single bed. It offers free Wi-Fi and flat-screen satellite TV. This larger, air-conditioned room has 1 double bed and 1 single bed. It includes free Wi-Fi and flat-screen satellite TV. House Rules Sercotel Sorolla Palace takes special requests – add in the next step! Sercotel Sorolla Palace accepts these cards and reserves the right to temporarily hold an amount prior to arrival. If you are traveling with children, please contact the property to provide the children's age. You can use the Special Requests box when booking, or contact the property directly using the contact details provided in your confirmation. Please note that when booking more than 4 rooms, different conditions and supplements may apply. The staff was very friendly and the room itself was very clean and much nicer than we were expecting. The location is about 30-40 minutes by bus to the city however, it is very close to the metro and bus station (about 5 to 10 minutes walk). Alternatively, if you take a taxi or Uber, it is only about 10 minutes to the city. I definitely recommend staying at this hotel and we will definitely be back next time! Swimming pool is more to relax than to swim,too small and too round. Great room,no noise,evrything you need ,great view.Very good breakfast! The location is close to the stadium and business park but not walking distance of anything else. Need to take a 15 euro Uber to go see the city or beach. No slippers in the room. No free water in the room (only in the lobby). The window looks the side where some club or bar is lockated and at night one can hear music and sounds of people -not easy to sleep. A big hotel with comfortable rooms. The window opens. Clean. Comfortable beds (two connected). 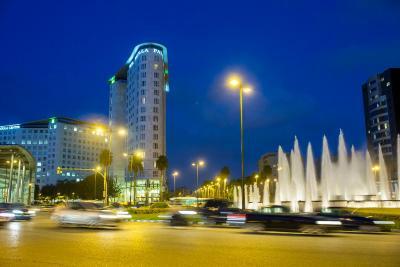 The hotel is very close to the city center but it takes less than 10 minutes with the metro to get in the city center. In the bathroom there is nice music with the different channels. The swimming pool is also nice. 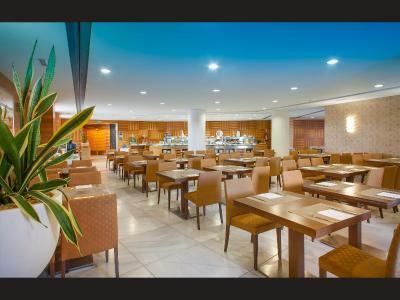 The area of the hotel is very modern and has several supermarkets. Dated and in need of redecoration. Nice, large, quiet, comfortable room. Bedroom and bathroom we're at opposite end of the room. Clean, tidy, lovely food, lovely staff. Upgrade to junior suite for 25euros was worth it. 14th floor, great views. Good staff,very comfortable room and bath. Some staff members do not understand or speak English very well. The key to the door often needed fixing/making a new one. The room was spacious. Nothing at all. It was brilliant. The meal in the restaurant wasn’t of a standard I would expect. The room was excellent, especially the bed.